These 11" Standard Balloons from AnyPromo are customizable balloons made from natural latex that's 100% biodegradable, so you don't have to worry if one accidentally flies away. Available in a selection of 13 individual colors or in an assortment of 6 colors (red, light blue, orange, yellow, green, pink). Customized with color imprint on an area of 5 1/2" in diameter. These promotional balloons are a customer voted "Top 100" item because not only are they helium quality at a budget-friendly price, they are made in the USA. Our balloons will stay up all day as well, with an average float time of 12-14 hours with helium. 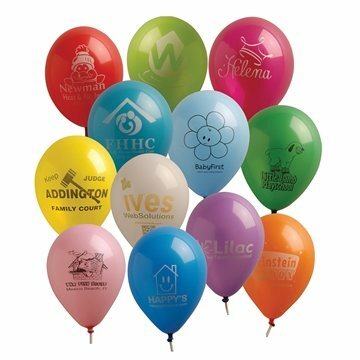 Not only are promotional latex balloons a great item for car dealerships, they are terrific for marathons, company picnics, or simply adding festivity to a restaraunt or grocery store. 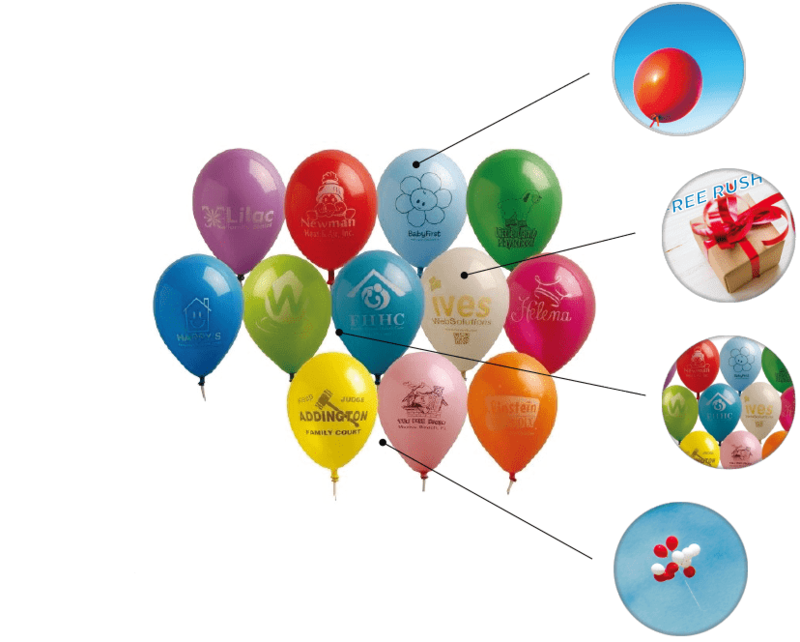 If you'd like to draw attention to your business, try one of our vibrantly colored balloons to catch eyeballs. 100 percent natural latex completely biodegradable imprinted balloon. Average float time with helium is 12-14 hours. Balloons should be stored in a cool, dark place until used. WARNING: Not for children under 8 years old. Whether you're promoting at a celebration or want to draw attention, balloons are a time-tested classic for branded promotions. These balloons are especially popular for children's events, grand openings, and drawing attention from a busy street. If one of these balloons accidentally flies away, you don't have to sweat it because they're made with 100% natural latex rubber that bio-degrades!. Looking to buy American products? 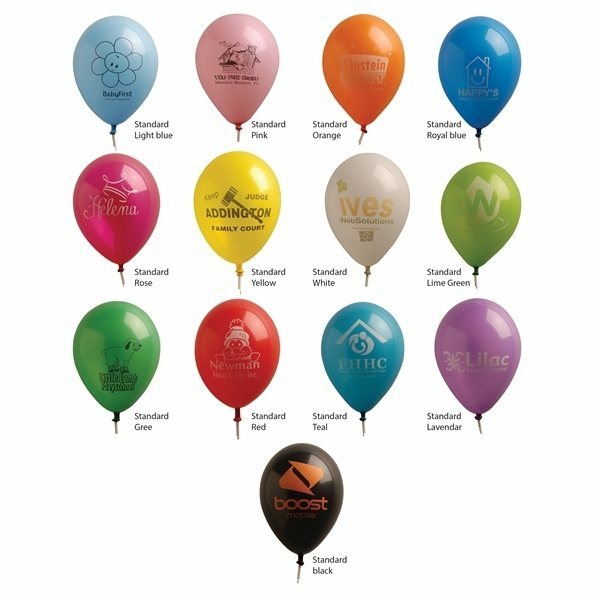 These promotional latex balloons are proudly manufactured and custom printed domestically in the United States. Need custom printed balloons in a hurry? AnyPromo has got you covered with free 1-day rush production with 1-color, 1-location printing. Rush Service on Catalog Quantities, 1 Color/ 1 Location Only. Fast turnaround. Great customer support. Balloons look awesome, they want me to have a full 100 characters so here it is. Loved the Balloons! Service was fast, Quality was good! The fasteners work wonderfully when making a huge bouquet. Quality and Value for the price. Good quality product at an affordable price. Good buy! Our Corporate Logo design layout look great.